This blog is devoted to fantasy, supernatural and decadent literature. It was begun by Douglas A. Anderson and Mark Valentine, and joined by friends including James Doig and Jim Rockhill, to present relevant news and information. If we think the authors in our field are sometimes neglected, then they are positively feted compared with some of the illustrators. Quite a few of their biographical notices remark “very little known is about the artist’s life” or some variation on this. Amongst those of whom this is said is Henry Weston Keen (1899-1935), who illustrated a highly desirable edition of Wilde’s The Picture of Dorian Gray, as well as an equally admired book of Jacobean tragedy, Webster’s The White Devil & the Duchess of Malfi: and a few other books. 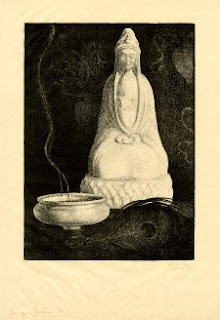 The British Museum has a lithograph by him, ‘Ming & Incense’, in which the serenity of the idol and the slow tendril of smoke from the incense bowl are subtly conveyed, and a peacock feather’s black eye and faint tendrils are dimly delineated . He lived in London: and died of consumption, it is often said in Switzerland, and that seems (to judge from the usual sources) to be all we know of him. I sent off for a copy of Henry Keen’s will. It is very brief, leaving six books of his choice to his brother, of 300 High Holborn, and the rest to Victoria May Barnes, who shared Keen’s then address, “Westwood”, Walberswick, Suffolk. The will was dated 25 June 1935: and he died the next day. The witnesses were R G Barnes of Southampton, and R E E Hadlow, a Merchant Marine Officer, of, Warley Lodge Farm, Nr Brentwood, Essex. The estate was valued at £208-13-9. When his brother registered the will, one month later, on 26 July 1935, he gave the farm address (in “Little Warley”) too: the witnesses were probably his friends. So it will be seen that Keen did not die in Switzerland, as some sources say, but in Suffolk: Walberswick was then a well-known artists’ retreat. Still, this does not tell us very much more and as the summation of the estate of a promising and subtle artist it has a certain poignancy. What lay behind that bequest of six books (evidently meant as a memento mori): why six? ; and which six did his brother choose? What other books were there and what became of them? Who was Victoria May Barnes: lover, companion, nurse, friend? And what comprised that £208 estate (worth about £11,000 today)? Did it include a Chinese statuette (though not Ming) or a delicate incense bowl or were these copied from a museum or conjured from the imagination? What became of his unpublished drawings? All text copyright (c) 2009-2016 by the respective bloggers. Not to be reused or reposted without expressed permission.